Theresa's Haunted History of the Tri-State: Theresa's Back on the Radio! Hey, everyone! Happy Monday! I wanted to take a few moments to share with you an exciting opportunity I've been given. I've been asked to return to Paraversal Universe Radio, with hosts Kevin Malek and Jennifer Scelsi! I will be taking part in the show's very first round table discussion. 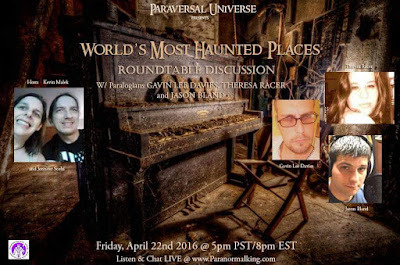 Our topic will be that is very exciting to me, and I'm sure to many of you as well----The Most Haunted Places in the World! I'll be joining two awesome guests: Gavin Lee Davies and Jason Bland. Gavin operates the Paranormal Chronicles website, a great source for all sorts of interesting and spooky articles. Jason is the host of Paranormal Soup--make sure to check out his YouTube channel for a variety of paranormal topics. The show will air LIVE Friday, April 22, at 8 pm EST. You can listen through the Paranormal King Radio Network site, where there will be a live chatroom available if you want to hang out and discuss the show, ask questions, or comment on what you hear. I really hope you make it...and if you do, make sure to mention in the chatroom that Theresa sent ya! But, if you can't make it to the live showing, and still want to listen in, the archives will be up within a day or two, and I'll make sure to post it on my Facebook page. Also, before the show airs, I'd love to have YOUR input! I've been asked to submit MY Top 10 picks for most haunted places in the world, and I'm really struggling with it. I mean, how do you categorize and rate a haunted location? How popular it is? The amount of potential 'evidence' collected, the stories associated with it, how many ghosts the places has, how often the activity occurs, how intense the activity? What??? Heck, I struggled with my list of Haunted America locations, lol. Hop on over to Theresa's Haunted History Facebook page and let me know what you think---how do you pick what is the MOST haunted, and what are some of the locations YOU think should make the list?